Size of this PNG preview of this SVG file: ४०६ × ४९२ पिक्सेल. इतर resolutions: १९८ × २४० पिक्सेल | ३९६ × ४८० पिक्सेल | ४९५ × ६०० पिक्सेल | ६३४ × ७६८ पिक्सेल | ८४५ × १,०२४ पिक्सेल. This file depicts the coat of arms of a Swiss Körperschaft des öffentlichen Rechts (corporation governed by public law). 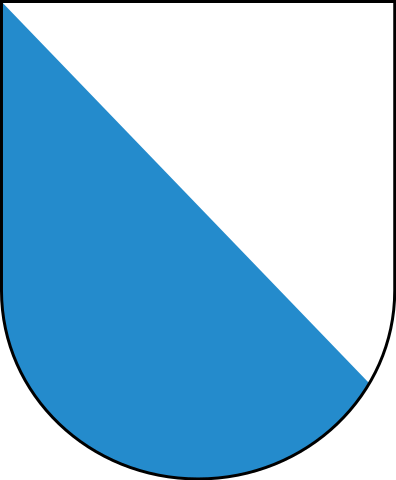 Official works like coats of arms are gemeinfrei (in the public domain). Note: The usage of coats of arms is governed by legal restrictions, independent of the copyright status of the depiction shown here. सद्य २३:०८, २४ एप्रिल २०१८ ४०६ × ४९२ (१ कि.बा.) Gunnar.offel offical COA, from offical document.theres no black border between blue and white. etc.